The Customs-Trade Partnership Against Terrorism (C-TPAT) is a voluntary program designed to improve public protection through close cooperation between the government and international supply chain partners. Companies who are C-TPAT certified work with the US Customs and Border Protection (CBP) to build out processes for minimizing their international shipping risks. These measures include checking shipments for illegal cargo, protecting customer data, and preventing theft. Because the US government considers these firms low-risk, they get to enjoy expedited cargo processing and fewer custom examinations. 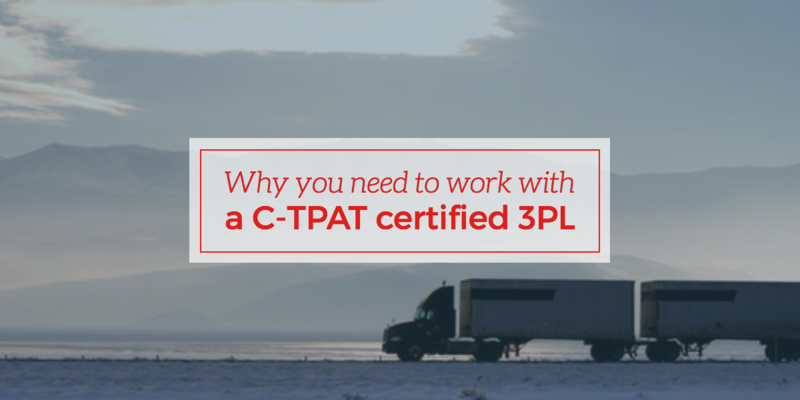 What are the benefits of working with C-TPAT certified 3PLs? International logistics companies who follow C-TPAT best practices have to invest heavily in their infrastructures like physical security equipment, IT systems, and specialized personnel training. Why would they volunteer to make such a large investment? C-TPAT certified companies maintain strong security practices in line with strict government guidelines. These companies run additional risk assessments to identify all possible supply chain vulnerabilities. Once they’ve recorded and evaluated these vulnerabilities, they can improve them until they meet or exceed industry standards. With this additional security practiced by C-TPAT certified companies, you have the peace of mind that your cargo will arrive at its destination safely and on time. This helps you avoid inventory shortages and maintain strong customer relationships. Certified partners have to maintain C-TPAT standards by monitoring and managing cargo in every part of the shipping process. This added accountability ensures certified companies are tracking the status of the cargo, and can give customers more reliable updates and visibility throughout the process. Visibility is essential for forecasting your future inventory levels and adjusting your shipping strategies when needed. When a logistics company complies with the C-TPAT guidelines and exceeds the security standards, customs will open up "green lanes” for most of their shipments. In green lanes, you are five times less likely to have your shipments stopped for a random exam. Fewer exam stops mean your cargo moves faster through international borders, to arrive at your warehouse or end customer sooner. Working with a C-TPAT firm goes beyond curbing terror and cutting clearance time at customs—the benefits also extend to your finances. One of the C-TPAT certification requirements is to streamline the entire supply chain. As a shipper, you will benefit from the better business integration of purchasing, shipping, and reception. The smooth flow of products helps increase efficiency, lower associated costs, and optimize for profit. The impact of threats such as terror or a cyber-attack has serious implications for your business. Delays and inconvenience of border point blockage or impassable roads can result in millions of lost dollars. A certified 3PL works with the government to develop and employ comprehensive risk assessment and mitigation techniques to keep your cargo secure and delivered on time. They also have preferential treatment to resume business after such an attack. This C-TPAT initiative transpired in response to the 9/11 attacks. To reduce the risk of terrorist acts like that from happening again, the US government began working with shippers for smarter practices. Working with companies who have taken steps to prevent terrorism isn’t just great for your supply chain, it helps make America a safer place to live. Partnering with a C-TPAT certified international logistics company may be all your enterprise needs to win more clients, gain partnerships, and catapult to success. The extended efficiency of the entire supply chain will help you lower costs, reduce risk, improve shipping speeds, and enhance brand-image business marketability. Working with a qualified, experienced, agile 3PL is one of the top strategies to help mitigate risks in your enterprise’s international supply chain. CAI Logistics is a C-TPAT certified firm that employs its expertise and long-standing relationship with carriers, haulers, and suppliers to provide creative solutions to mitigate risks and guarantee delivery times. Contact us today to get a quote and learn how we can use our consultative approach to help you achieve your long-term shipping goals.